I posted a couple of weeks ago about the house on Stanley Avenue by the Macs (near the corner of Ferry Street) that was torn down. It is a very large lot, that I assume will sit empty for quite a while. 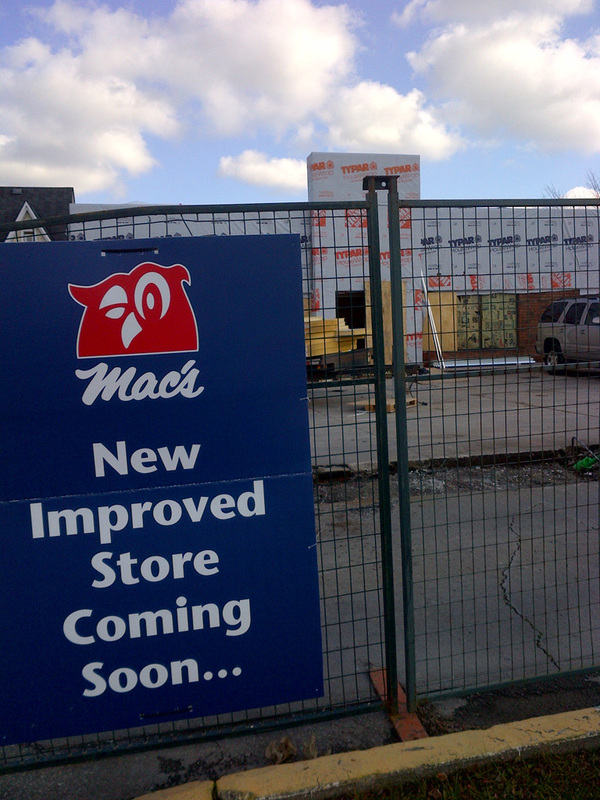 The new Mac’s convenience store location (former 7-Eleven) is almost ready to open. The gas bar is in place, the store looks stocked, and the parking lot has one layer of pavement on it. The Mac’s convenience store/Shell gas station that will be opening at the corner of Stanley Ave and Ferry St is coming along. The other day the big Mac’s sign went up on the building. I had posted previously that the underground gas tanks at the new Mac’s convenience store location (former 7-Eleven) at the corner of Stanley Ave and Ferry St were being taken out. I was wrong. It turns out they are just cleaning them up. The 7-Eleven used to have a Beaver gas bar with it. I missed this before, but the Notice of Application I posted before, says that a Shell gas station will be there. That’s interesting. There used to be a Beaver gas bar not too far from where I live, but it closed and became a Shell as well. I didn’t realize that Shell owned the Beaver name. I wonder if most/all are going to change from Beaver to Shell. Work is continuing at the new location of Mac’s convenience store at the corner of Stanley Ave and Ferry St (former 7-Eleven location). I haven’t been by for a few days, but the former 7-Eleven location at the corner of Stanley Avenue and Ferry St was coming along nicely. I’ve posted before that it is becoming a Mac’s convenience store. They have dug up the parking lot and taken out the gas tanks that were there. There has also been a sign up about a Notice of Application. They want to put a sign up that will be closer to the road than it is supposed to be.